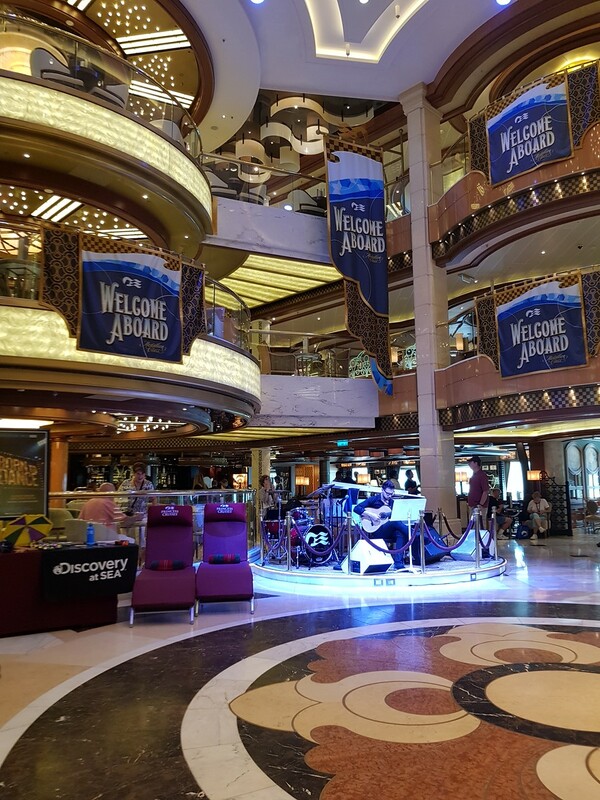 Once we had boarded the ship, we were guided into the Piazza, greeted by “Welcome Aboard” sash-wearing smiling staff and directed to the mid-ship elevators. The Piazza was also decorated with new Medallion Class Welcome Aboard banners – this is all part of the new welcoming experience. Wishing to try out our Medallions, we headed straight for our cabin – a mini-suite on Marina deck forward. We were expecting the door to magically open as the handle was pushed down but nothing happened so we ended up trying to repeatedly scan our Medallion against the new reader. Unfortunately the Medallion did not open our door. 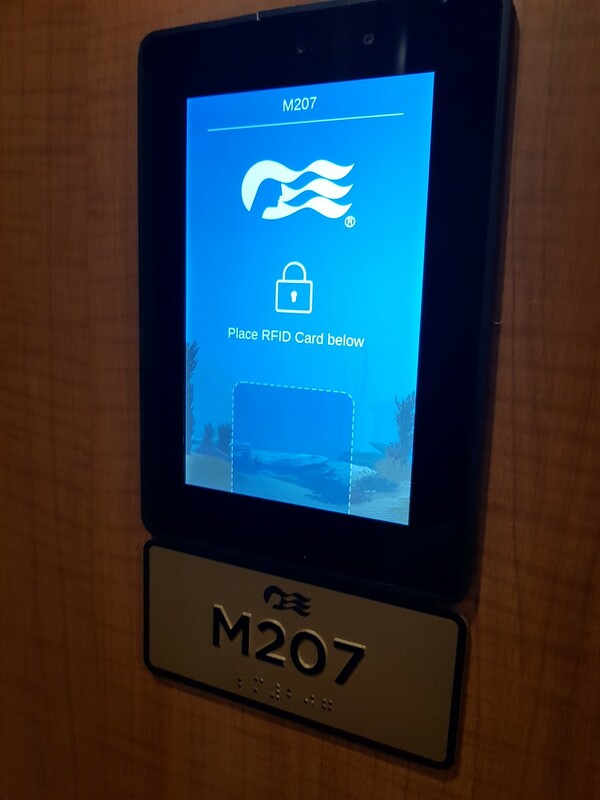 There was a techie in the corridor and he advised us that they were working on it but that we could access our cabin using our cruise card against the reader in the meantime. Luckily, the cruise card worked first time and we could get into the cabin. In fact, we were not able to use the Medallion to access the cabin at any point during the 2 day preview cruise. We did hear that it worked at first for some passengers but then they had to revert to their cruise card. While disappointing, we knew this was a trial and the door opening technology is breaking new ground. *update 20th March* doors are now opening for most of the Medallion trial passengers, although at times the door activation process can be slow. Once in the cabin, we noticed there wasn’t a card to indicate we required privacy. We guessed this was because a Medallion door no longer has a slot but on the second day we received a new door hanger card to address this. We were also provided with a dummy card for placing in the card slot for controlling the lights which does not need to be removed. Turning on the television, we were shown a brand new Safety Video which showed clips of various Princess ships, locations and staff interspersed with amusing appearances from the original Love Boat cast. 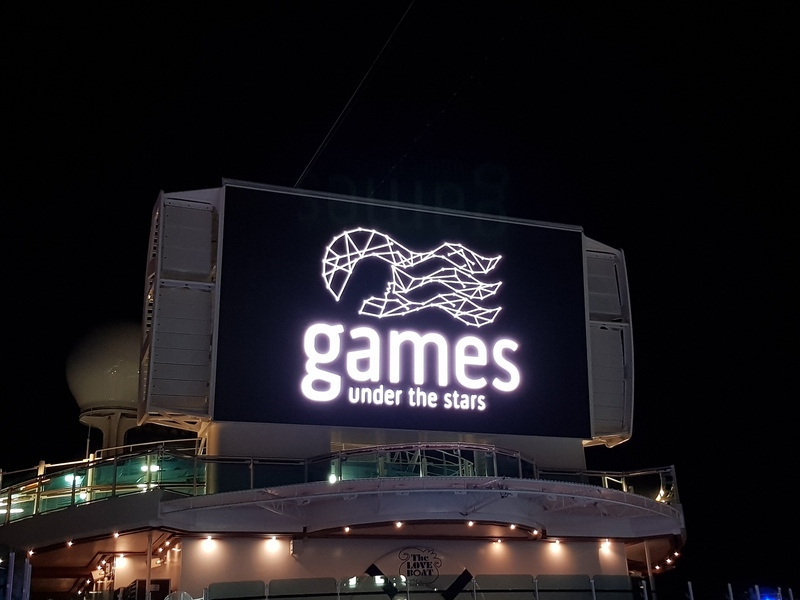 The television offerings had also been expanded to include shows from Ocean Vacations and it was confirmed that all staterooms will now have a new 43″ 4K Touchscreen television with a simpler remote. Next, we checked the time and location of our Muster Station (Art Gallery) knowing that this was the location for all Medallion cabins in the trial. However, the patter now referred to it as the Guest Safety Drill and stated that we no longer had to take lifejackets along. This is a great enhancement and will be a popular move with all Princess passengers. Also, rather than wait for the Captain to read out the details there is now a pre-recorded message which is upbeat with some comedic elements. We dropped off our hand luggage and headed up to the Lido deck. 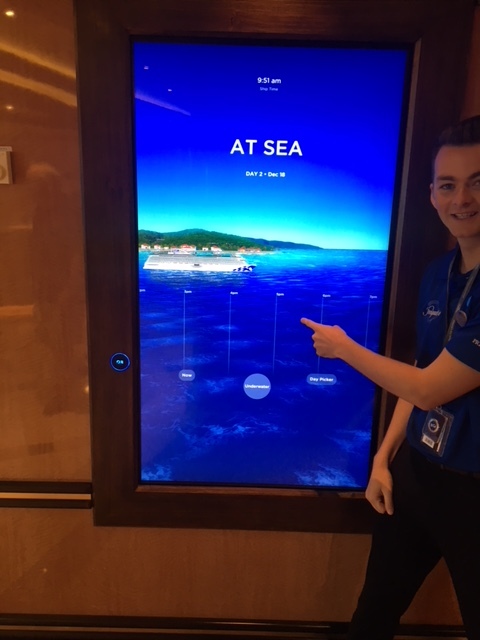 On the way, we checked out the touchscreens in the forward elevator lobbies on the decks with the initial Medallion cabins (Baja 301-336, Marina 201-243, Lido 201-302). 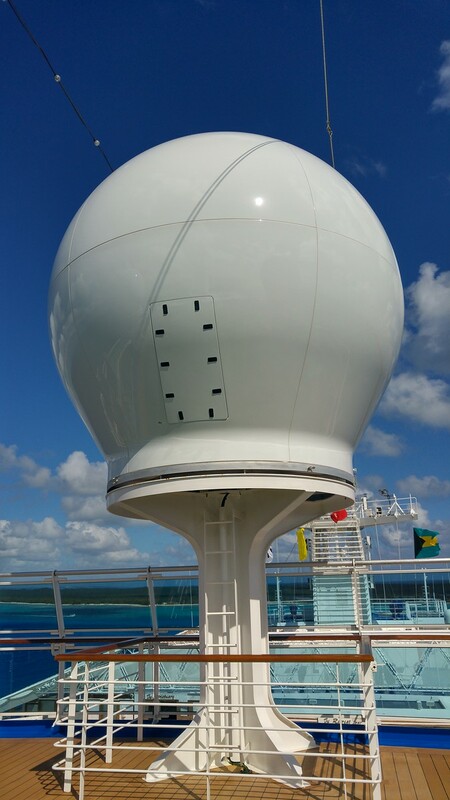 *update 8th April* Trial has been expanded to 160 cabins. 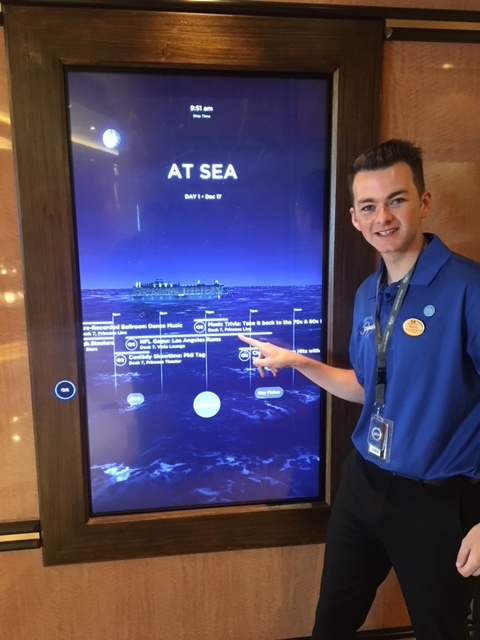 *update 18th December* Assistant Cruise Director Aaron from the Regal Princess has sent us updated pictures of the Touchscreens in action. 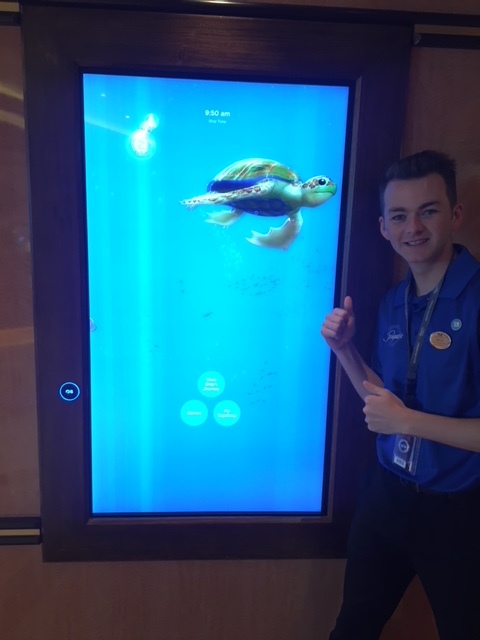 Here you can interact with your Tagalong, just touch your cruise card and you can set up your Tagalong on the interactive screens and touch again to ‘tickle’ it. 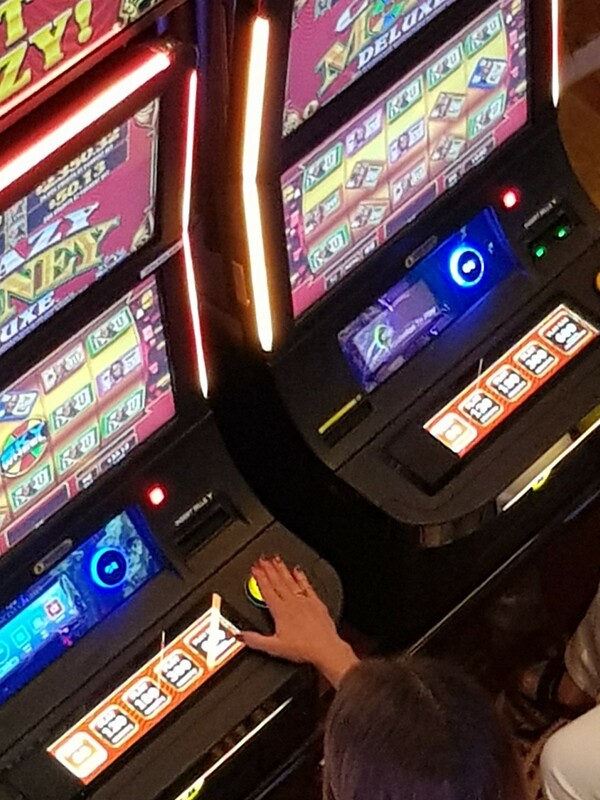 You can now also play games on the touchscreens. 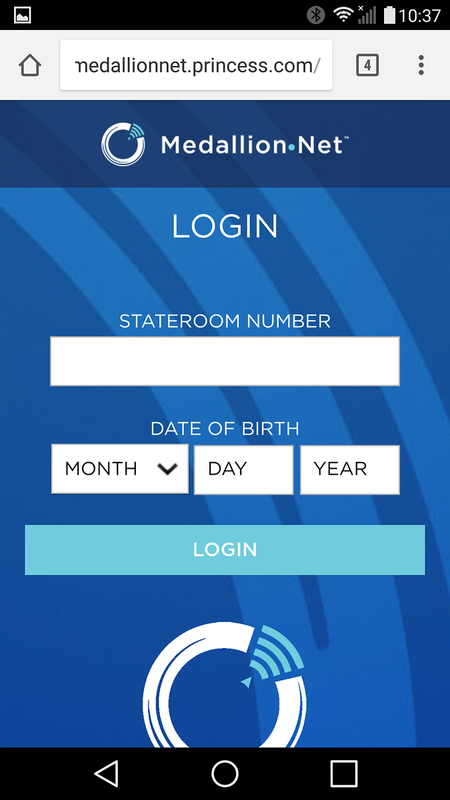 In the future, you should be able to login and view your bookings and “like’ other passenger’s Tagalong charms. 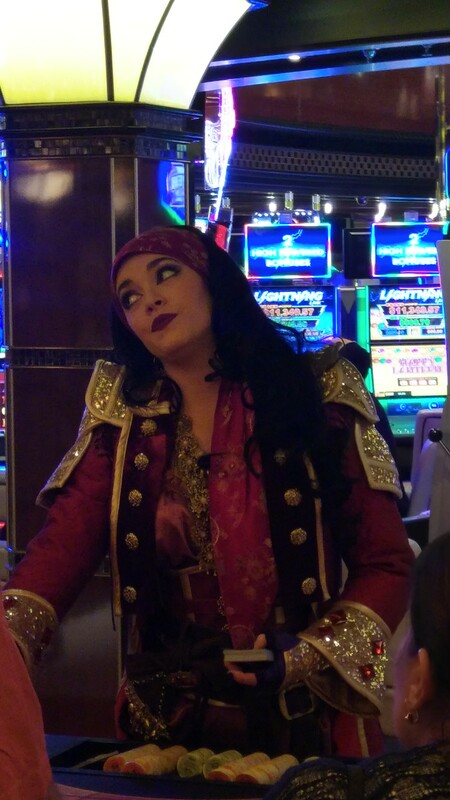 Once up on the Lido deck, we sat near the Trident Grill and ordered our first drinks. We thought the drinks waiter would be able to identify that we had the drinks package using our Medallion but again had to hand over our cruise cards for this and all other drink requests on the cruise. We also had to use the cruise card for making purchases in the shops. Platinum and Elite guests are currently receiving free unlimited access, replacing the previous complimentary minutes plan. 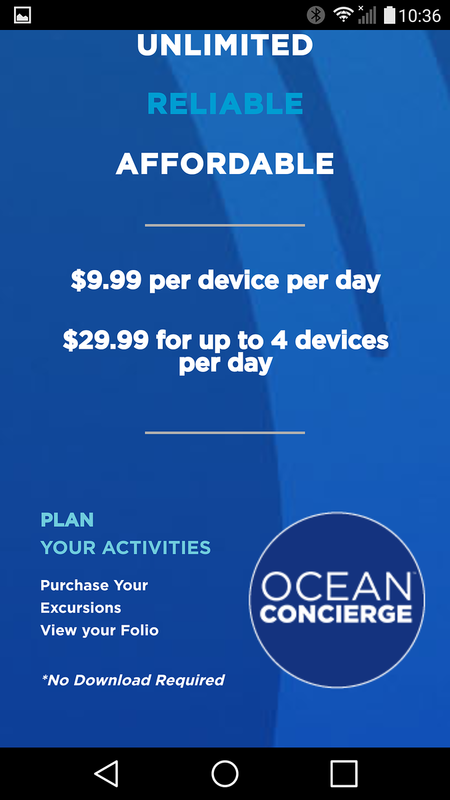 Other guests will need to pay $9.99 per device per day or $29.99 for up to 4 devices per day. The best thing is not having to worry about logging off and being able to switch easily between devices. MedallionNet is also available to use on Princess’ private island Princess Cays and it is hoped it will be rolled out to other ports. 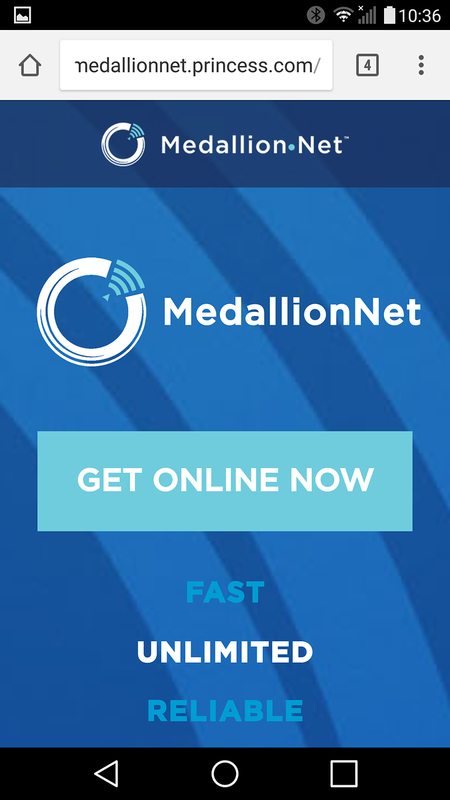 Another great benefit is that you can use messaging apps like Facebook Messenger, What’s App, WeChat for free just by connecting to MedallionNet wi-fi. It will be interesting to see how it performs in the Baltic (from end of April 2018) as it is unclear what performance we can expect from the SES satellite constellations in the Northern hemisphere compared to the optimised Caribbean connectivity. Ocean Concierge is the free-to-use site which replaces the functionality provided by Princess@Sea. You can access it from the MedallionNet login page. Here you can plan your day’s events and activities, review the ship’s itinerary and port guides, browse menus, access your stateroom account and order breakfast for your cabin the next morning. 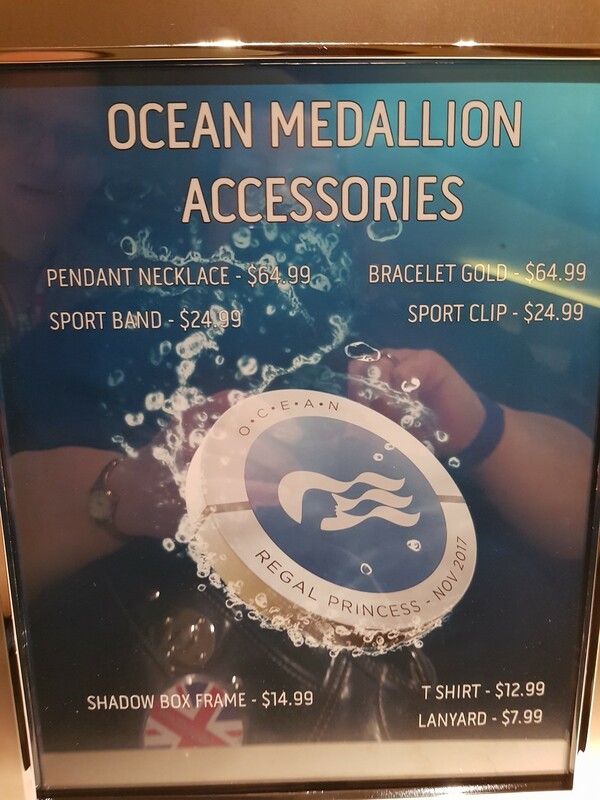 After eating lunch, we went down to deck 6 to look at the dinner menu and came across the Ocean Front store which was being setup for selling Medallion Accessories. Here, there were a number of offerings ranging in price from $7.99 to $64.99. The necklace and bracelet looked very elegant but were not designed to be expandable. The lanyards are designed to colour match your loyalty status and you were not permitted to buy above your status. *update 9th December* Blue lanyards and ‘limited edition’ Test Pilot License cruise cards are now being issued rather than wristbands. 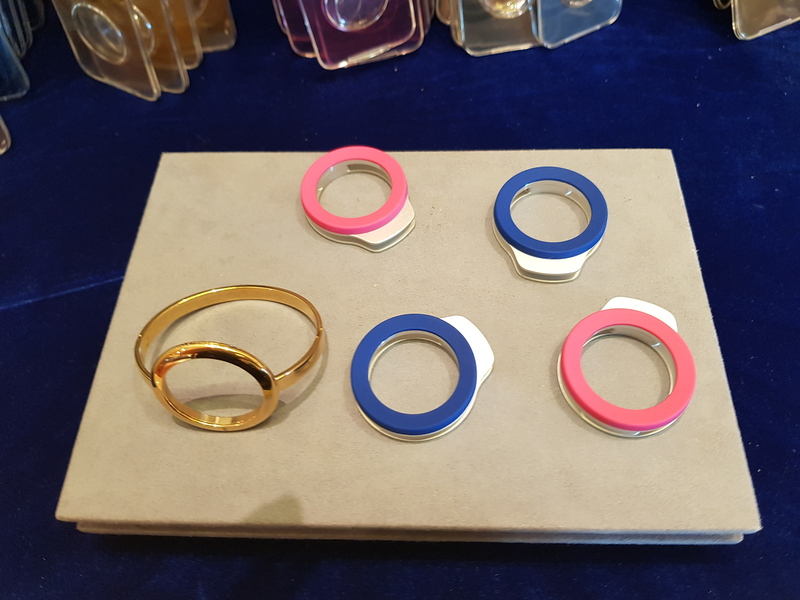 *update 21st September* The wristbands have now been modified with an extra strap to prevent it falling off and will be available as an accessory. 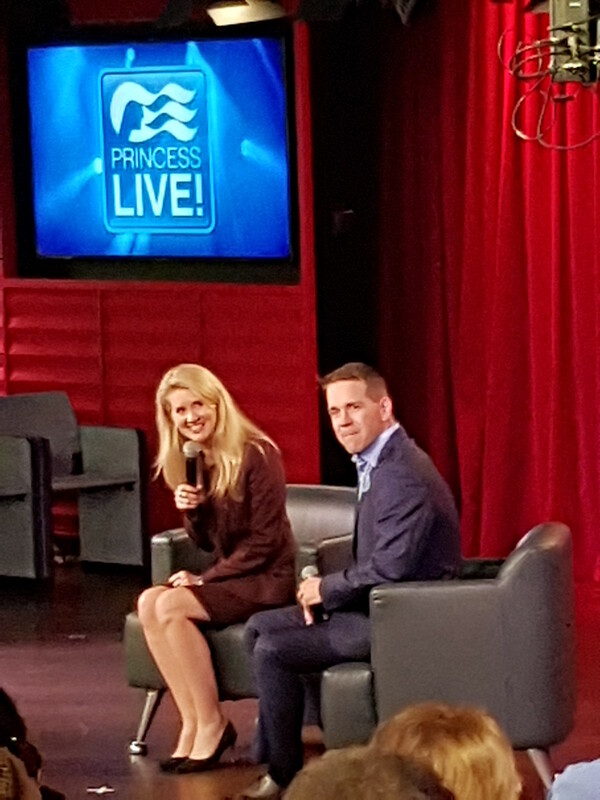 The presentation was very engaging and open about the issues and rollout approach – not committing to any dates on other Princess ships until Regal Princess was completed. 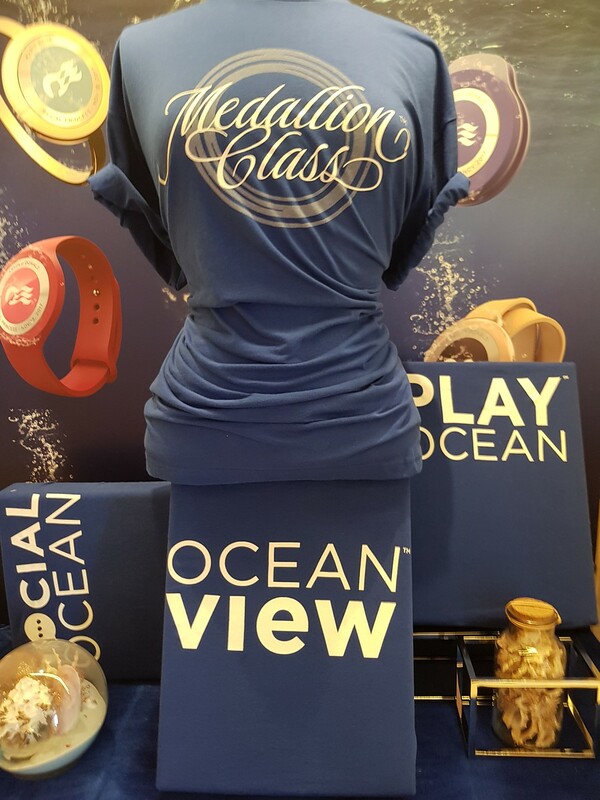 A second presentation the following day was open to all passengers and went into further detail of how the Medallion experience would create a more personalised, simplified, and immersive experience for the guests and crew. After attending the Guest Safety Drill, we headed up to the Fountain Pool on Lido deck to watch the new Sailaway celebrations. 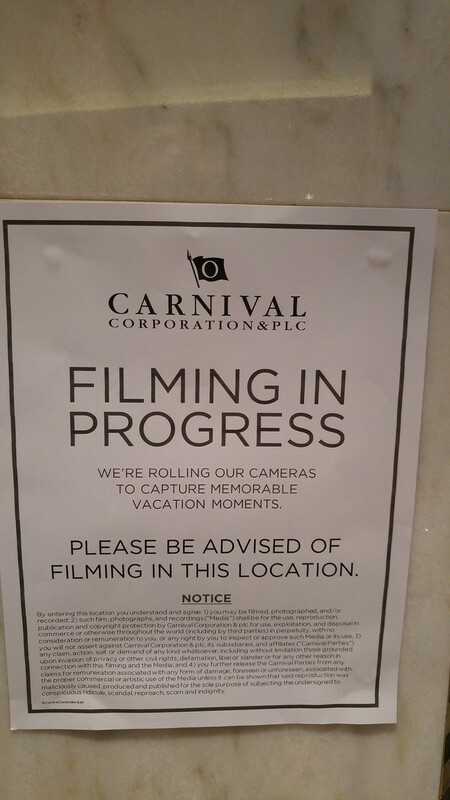 This involves a new song and dance routine, embarkation photos of passengers, a message from the Captain, a brief history of cruising, a countdown, the Love Boat horns and a parade of flags from the part of world you are visiting. It culminates in a video of different members of the crew singing along to the Sailaway song while the fountains keep in time to the music. Unfortunately it started to rain so the live band couldn’t play after that so we headed indoors. A number of new entertainment features also debuted on this cruise. A new Room Service menu was also rolled out on this cruise. Rather than being available 24/7 it seems to have been reduced to 20 hours a day (no details yet on actual hours). Note that there are also more chargeable items and small liquor bottles can no longer be purchased during the cruise. While the technology still needs some work, it was exciting to be a “pioneer” user of the Ocean Medallion. The biggest success was MedallionNet – a vast improvement on the previous offering. It wasn’t all about the tech – every staff member we encountered on this cruise was enthusiastic in their welcome. The Navigators were also very helpful and a great asset. It should be noted that this preview cruise was only 40% full and included a number of the companies and contractors involved in the Medallion development. We hope to return to the Regal Princess once the Medallion has been fully rolled out. Caribbean Princess has now been fully upgraded. 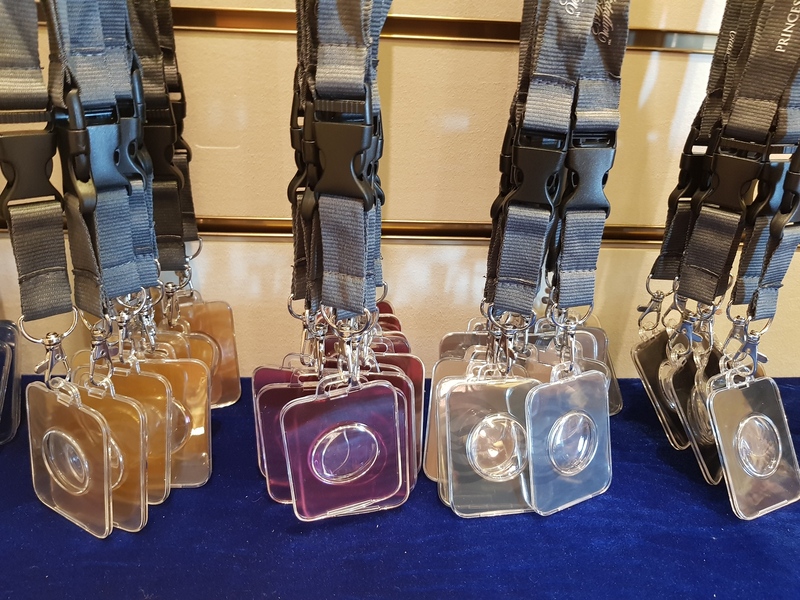 All decks now have the Medallion and can be used for embarking/disembarking, opening cabin doors, paying for items in the shops, paying for drinks and in the casino. 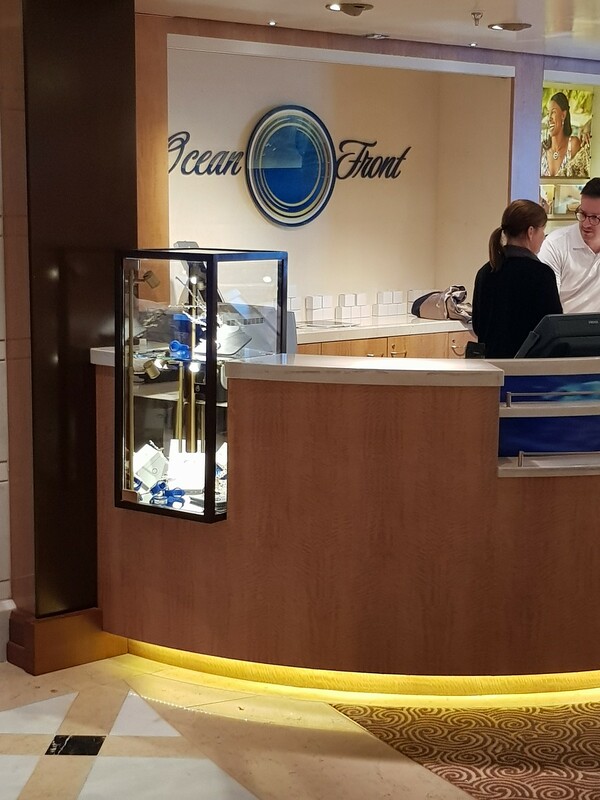 Caribbean Princess has now had an Ocean Front store installed with the same accessories as Regal but is also displaying Medallions in different colours to match your status with a “Coming Soon” sign. 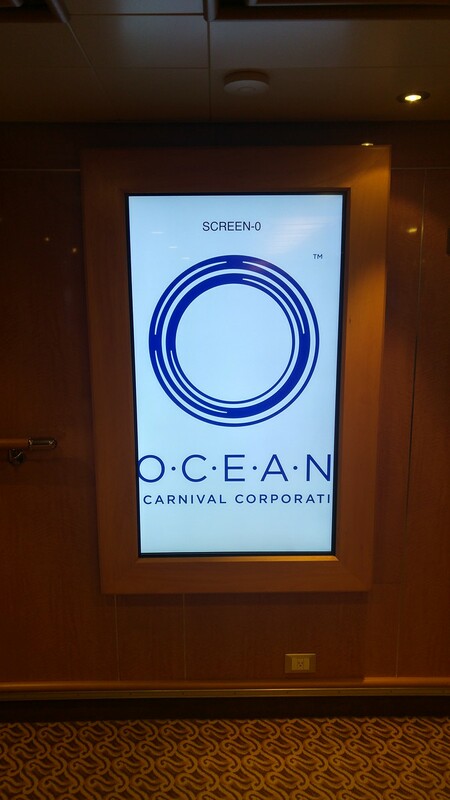 It also has an Ocean Casino area with portal screens where you can play Casino games for money (whilst at sea). 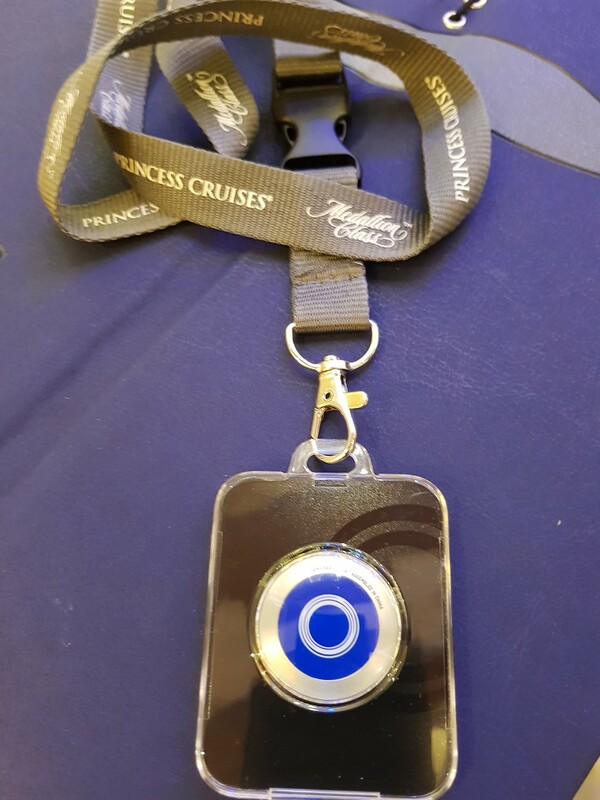 Regal Princess is now fully activated: all passengers receive medallions and the medallion has replaced the cruise card. It works for unlocking cabin doors, at security during embarkation/disembarkation, ordering drinks from bars and in the shops. Plus it is now possible to show where you are and locate other members of your party using the touchscreens around the ship. Royal Princess is now medallion-activated. 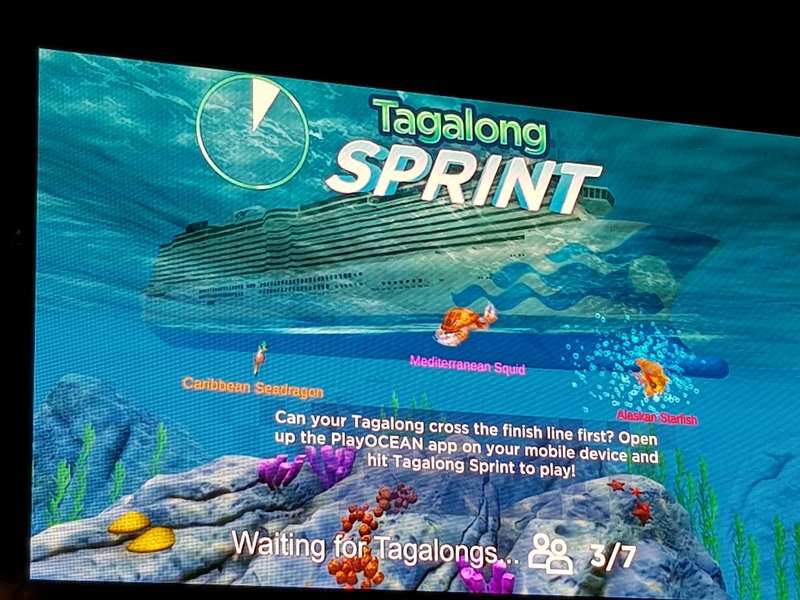 Next Next post: Our top 5 new things to try on Norwegian Bliss! Thanks for the update. It’s quite an undertaking to convert all of the ships. 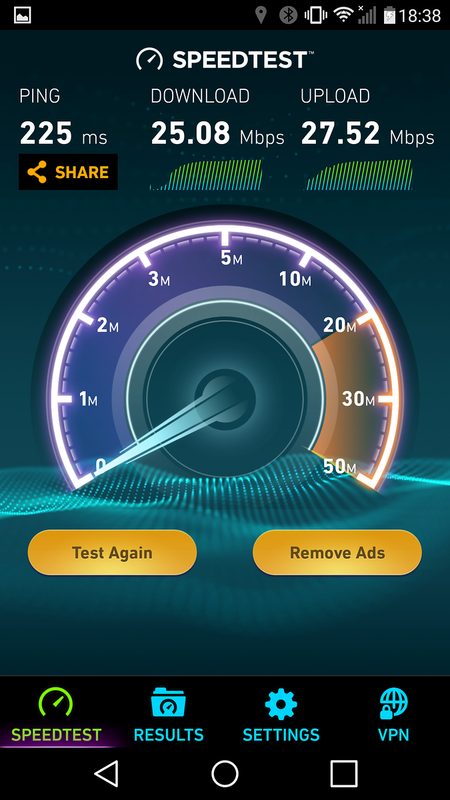 Now we get to experience our technology frustrations at home and at sea! 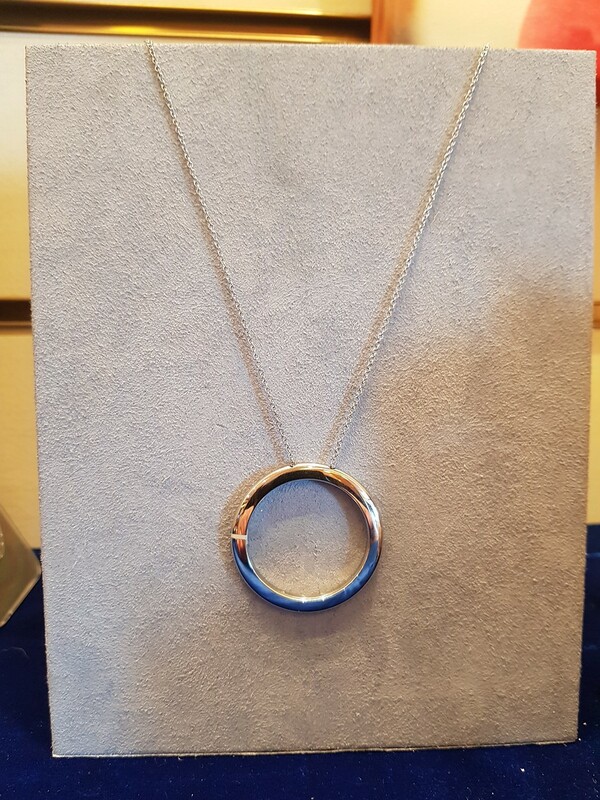 Thank you very much for your post about the medallion.